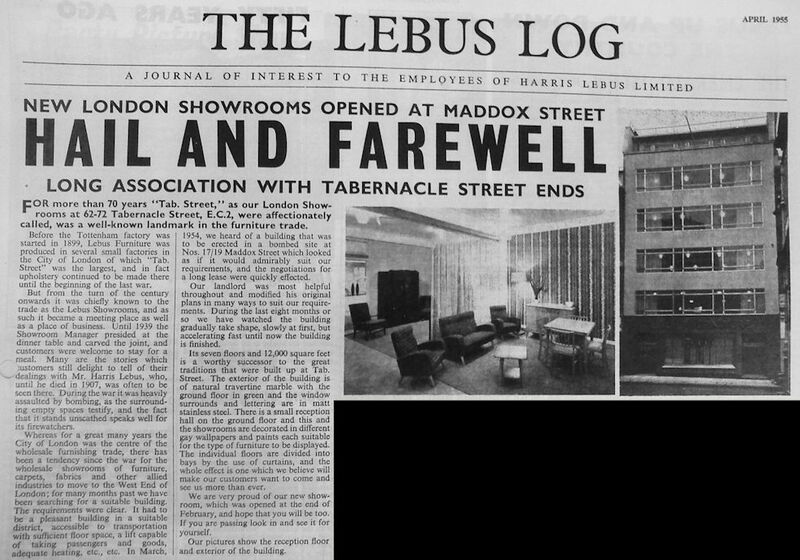 A personal memory of the Sales Department at Harris Lebus 1953-66. I finished my National Service in 1953 and needed to get out and earn some money, a commodity very little of which had come my way to date. Being a company representative seemed to me to be an ideal occupation, driving around in a big car, chatting to people and entertaining them in posh restaurants etc. The problem was that I had very little to offer a prospective employer Trawling through the situations vacant columns of the Daily Telegraph I spotted an advertisement for a Clerk Progress with the magic rider “Full commercial training given”. I had no clear idea what either entailed but felt I could cope. Mr Moon in personnel told me bluntly that I was not suitable for the position offered, denting my pride somewhat, we chatted and he told me that the company had just decided to start a training course for representatives, was I interested? You bet I was. At the time of my arrival Mr Herman Lebus was the big boss, his son Oliver responsible for Sales and his brother Anthony for the factory. Syd Lawrence was the Sales Manager and Alistair Maclean (universally known as Mac) was his assistant. Initially I was employed in the Sales Office on the first floor doing incredibly boring jobs like splitting invoice sets and sorting them into bundles. I then progressed to what would now be called Customer Services which entailed sitting in a small cubicle with a dictating machine answering customer letters and telephone calls. 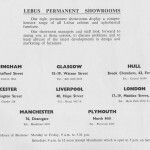 A popular sales tool at the time was to run local temporary exhibitions (known as Stockrooms), a practice which HL used heavily. 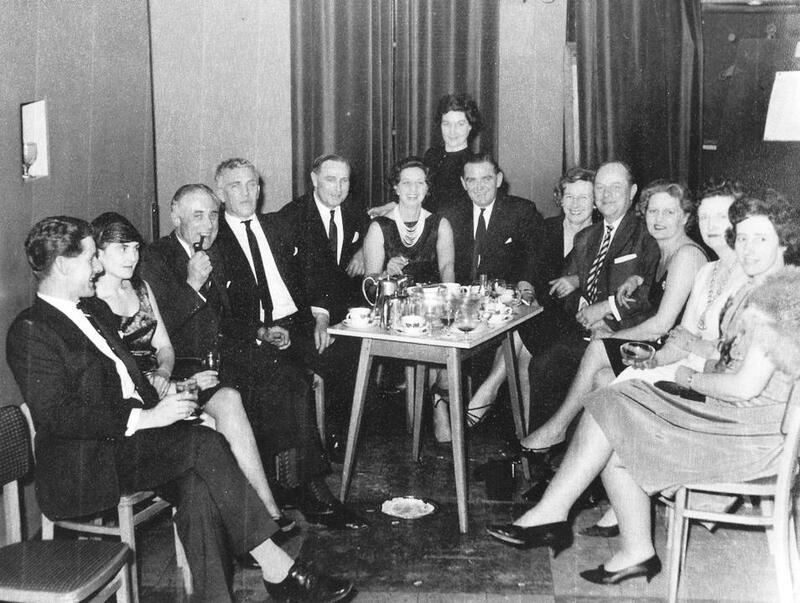 Two or even three times a year a rep hired a large room, often the ballroom of the local hotel for a week, and filled it with the company products especially new designs. He invited all his customers to inspect the range and of course place orders which were the foundation of the coming years trading, many were entertained, in some case to a meal, sometimes these meals became eagerly anticipated local trade events. I and any other body that could be spared were sent out to assist the reps at these events, this entailed being on site early on the Sunday morning to meet the van, unload and help to set up the exhibition. An average show might have eight bedroom, six dining room and eight three piece suites and occasional furniture galore. If needed the van would arrive back on Friday to collect but it was a matter of pride to sell off all the product and deliver it by local carrier at the end of the week. They were mainly very enjoyable and instructive weeks but it could be quite taxing and I remember there were occasions when there was no time to go home over the weekend leaving a Saturday graced by a long slow train journey say from Plymouth to Middlesbrough. In one year I did seventeen stockrooms. The company also ran permanent showrooms, initially at Tabernacle Street in the East End which was replaced by Maddox St in the West End. When not trotting around the country I acted as a salesman there on Saturday mornings. One of my few encounters with Sir Herman Lebus occurred at Tab Street (as it was generally known), we had recently taken on a new bed settee which had a particularly powerful metal folding frame, you lifted the back squab then grasped the back of the seat and pulled it upward and outward until the action took over and it opened out flat It fell to me to demo this new product to Sir Herman, while leaning forward and pulling up the seat my feet lost traction on the polished floor and I lunged headlong into the bowels of the settee, the back closing down to complete my humiliation. Sir Herman kindly lifted the back so I could escape, he said nothing but walked off with an expression which clearly said “where do we get them from?” I spent several days expecting to be called in and sacked. 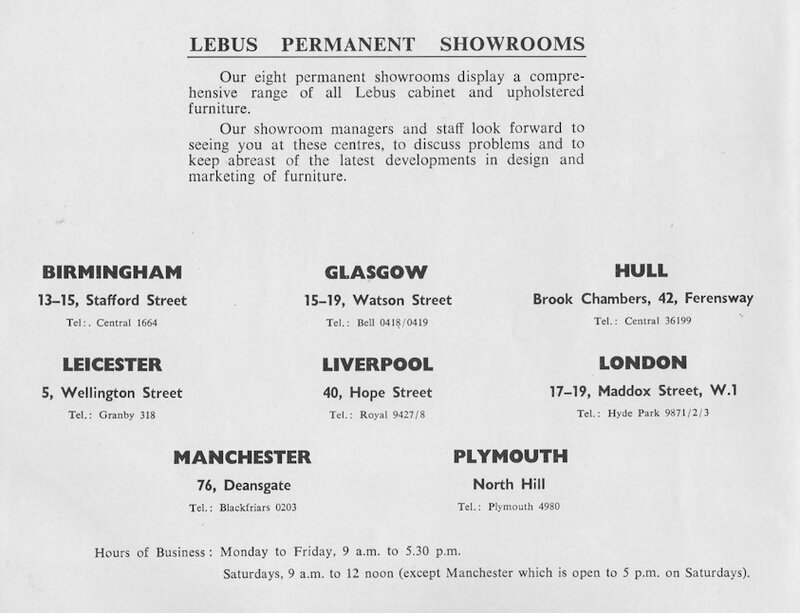 Individual reps were ambitious to develop the permanent showroom idea and Birmingham, Leicester, Manchester and Glasgow were early additions. I was sent to the Birmingham showroom to assist Harold Ing, the manager. Later Ronnie Boss, the local rep opened a showroom in Hull and I was sent there to run it for him. Ronnie Boss was promoted to Tottenham as Sales Manager cabinets and Fred Farley took over his territory. The Trade ran very large national exhibitions, the most important one being held at Earls Court. Here everyone who was anyone in the trade exhibited lavishly and expensively. HL indulged in the mother of all double decker stands demonstrating their pre-eminence, all the reps came down to man the stand and hovered anxiously waiting for their more important customers to arrive. There were also provincial shows at intervals in Glasgow, Manchester and Birmingham which the company supported. 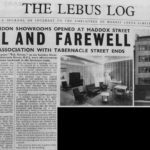 Later we stopped going to Earls Court and instead invited all our customers to our Maddox Street showroom. As an incentive we laid on a magnificent buffet and employed the “Corps of Butlers” to look after the diners, it was very impressive. Maddox Street was a very up market five storey modern building just off Regent Street. I recently walked passed it and noticed that it is now a very expensive looking restaurant. My next move saw me sent back to the Birmingham area to take over the West Midlands territory from Ray Burton, who was promoted to Sales Manager Upholstery. The “Black Country”, which was the core of my new territory, is a group of heavily industrialised small towns running one into the other and nestling between Wolverhampton to the west and Birmingham in the East. The lovely people who live there are a race apart and speak a language of their own. Every fortnight I called on a good customer who always insisted that I went with him to his local pub for a sandwich. During the years that this happened I can honestly say that I never understood more than a quarter of what was said by the locals. He translated when necessary. The HL core product range was unashamedly aimed at the lower or mass end of the market. Aesthetically it was dated but superbly made and very competitively priced. The number of pieces that fetch good prices in the retro market today bear evidence to its longevity and quality. It sold in high quantities and could be found in every starter home and boarding house in the country. It was often said, and not entirely inaccurately, that “HL made the best crap in the business.” There were many forays into the upper market and attempts to keep up with the rapidly changing fashions. The LINK Range was an attempt to establish the company in the contemporary market, arguably its fault was its superb quality which made it too good for purpose. In addition HL factored in a large range of occasional furniture, made a large range of upholstered furniture at its Woodley factory and a range of bedding at Eventide. In modern parlance HL offered a one stop shop to many small and medium sized retailers, who used the comprehensive catalogue and the exhibitions to good effect. The furniture manufacturing trade was largely made up of many small and medium sized companies. With a large sales force, heavy exhibition coverage, a first class catalogue and a huge product range. HL stood out as a giant amongst them. The company reps had a high status in the trade partly through the character of the people employed and partly through the strength and integrity of the company they represented. During my era vacancies were always filled from trainees. The course to which I was recruited never materialized nor did I ever receive any formal training, only on the job experience through National exhibitions, showrooms and stockrooms. At the time we complained of being used as slave labour (have there ever been trainees anywhere who have not claimed such misuse). The thirty odd strong salesforce was controlled by three area managers, Reg Holloway in the South, Ron Wightman in the North of England and I can’t recall who in in Scotland. When Ron Wightman retired he was replaced by Harold Chadwick (Leeds). 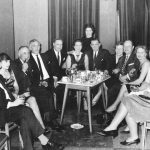 The whole sales force gathered for the annual sales conference initially held at the Russell Hotel in London (or similar) and later moved to the Grand Hotel in Eastbourne, which offered more facilities and better value. This event was eagerly looked forward to by the reps who spent much of the year out on their own particularly in the more remote areas. Here they got a view of new designs planned for the coming year and a chance to express their and their customers’ opinions on current models. After a few years I was called back to head office as a sales executive (nobody could think of a better title). At this stage Mr Oliver was Sales Director, “Mac” Maclean General Sales Manager assisted by Ronnie Boss SM Cabinet and Ray Burton SM Upholstery, Peter Barnett was Advertising Manager and Cyril Rostgaard Chief Designer. Jack Thomas was without portfolio and shortly retired leaving me a variety of tasks, it is a notable fact that at this stage the word marketing does not appear in anyone’s job title and probably not even in their vocabulary. My functions were varied including input into National Exhibitions Sales Conferences, Showrooms Trainees, to name a number. When Sam Perrett retired I took over the managership of the Maddox Street showroom and operated from there. My last task with the company was working with each rep, to review and restructure the Sales territories so that they reflected the demographic changes which had occurred since their inception before the war. Alas times change and perhaps HL was too big and too unwieldy to adapt quickly. Leonard Grosbard was appointed as the new CEO and he in turn appointed a new Marketing Director. A new world which demanded training and skills which I did not possess. I accepted an offer which would now be called voluntary redundancy and went my way to fields afresh.